A rapidly growing Engineer to Order (ETO) manufacturer of large industrial machinery was beginning to experience capacity issues. They were facing double-digit annual sales growth and conventional wisdom was to expand the shops footprint in order to obtain additional throughput capacity. Since the existing plant layout was created in a somewhat haphazard fashion, there was also a great desire to improve the appearance and promotional value of the shop for visitors; however no additional space was available and moving to a new building or leasing additional space was not an option. PES was engaged to lead the client’s team in redesigning the plant layout and to make more effective use of space within the existing four walls. 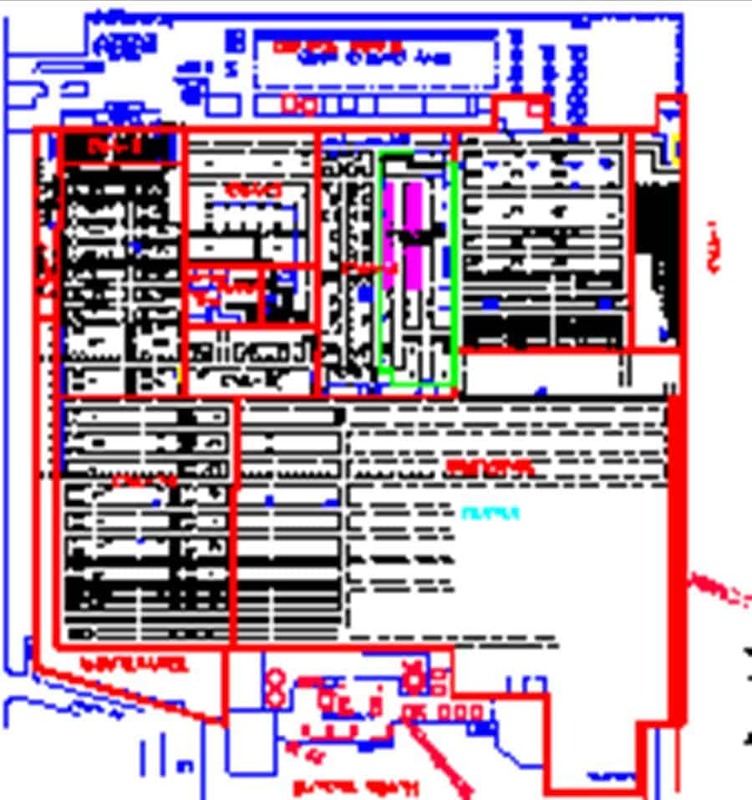 A systematic layout planning approach was employed to analyze operational processes and layout requirements. This fact-based approach helped to avoid the personal preferences/agendas, preconceived notions and politics common to every organization. The team conducted a thorough analysis of material flow and activity relationships. This began the process of a paradigm shift. New kit carts were designed and built to improve material handling and control. Simultaneously a 5S style project was undertaken to better organize the shop and free up much needed floor space. Alternative viable Macro-Layouts were developed each with advantages and disadvantages. These alternative arrangements were evaluated based on predefined criteria using a formal scoring and ranking method to highlight the macro layout most suitable for this client. Based on this objective analysis, the best layout was selected, detailed (i.e. the Micro-Layout) and implemented. The bottom line was a 50 percent improvement in throughput capacity without the need to expand the factory footprint (which many considered an unrealistic objective). In order to respond to an ever-changing market it was imperative for a Big Three automaker to transform its assembly operations into a faster, more flexible production system. A key part of the solution involved implementing a Lean Material Strategy (LMS) which could respond to changes very quickly. PES was commissioned to assist in the planning, design and implementation of the LMS at their high cost per vehicle assembly plant. 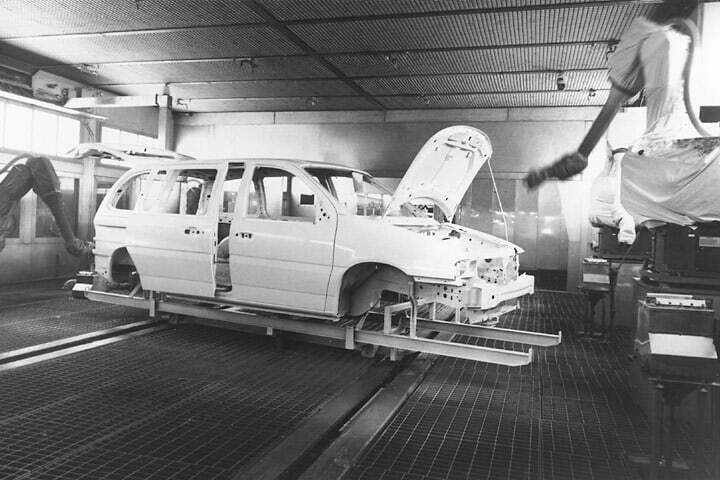 This plant was slated to expand complexity from five to seven models, resulting in significant proliferation of parts. 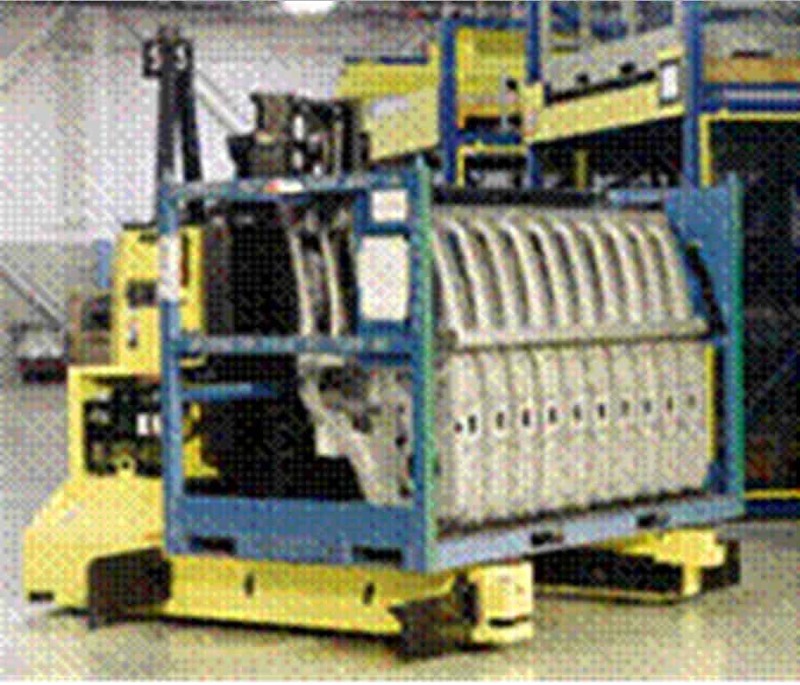 The explosion in assembly components presented a number of productivity and material flow challenges, including increased pick face/operator envelope, soaring operator walk and search time for material, difficulty in presenting large variety of parts in an operator-friendly fashion, and build-up of inventory, among others. To tackle these challenges, we dramatically expanded the level of material kitting performed in the Trim Shop. Our objective was to get the right part to the right place at the right time with no decisions for the assembly operator, thereby eliminating waste at the production line and significantly reducing mental and physical burden. At the same time, it was desirable to in-source sequencing to reduce reliance on a costly third party sequencer and integrate those commodities into the assembly kits where practical. A decision tree was used to determine the most efficient material presentation for the Mainline Operator (e.g. kit, minomi, sequence, travel tray, bulk, etc.). PES worked with the team to develop and maintain an accurate PPFEC (i.e. Presentation Plan for Every Commodity) database which included part, container and lineside presentation data. The PPFEC database was the foundation for designing a realistic Lean Material Strategy tailored to the specific needs of this plant. Our team designed and built prototype kit boxes/bags that segregated parts by zone of vehicle, displayed them to the assembler in an easily accessible and ergonomic fashion and maximized kitting. In addition, we helped design and develop prototype kit presentation carts, which are placed on the skillet conveyor (or, in the case of the Doorline, synchronized with the overhead conveyor), and travel with the vehicle (and operator) as it progresses from operation to operation, facilitating assembly work in the green zone. 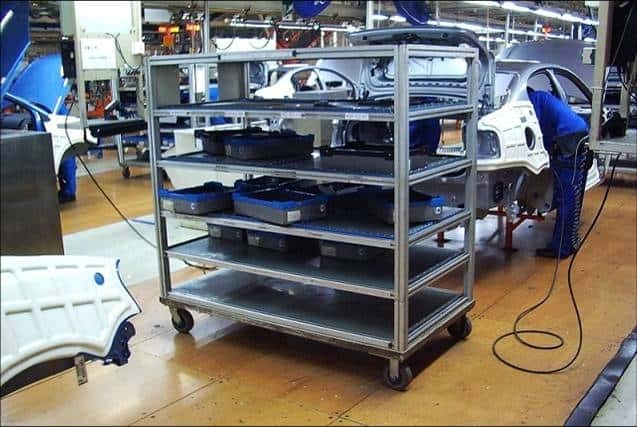 This plant’s lean approach to vehicle assembly dictated the buildings were “shrink-wrapped” around the assembly processes, creating major floor space constraints. PES performed comprehensive layout optimization and material storage analyses in order to free up needed space for kitting, sequencing and additional material storage. This included recommendations for appropriate material handling and storage equipment and methods that supported the lean material strategy. This activity alone helped to avoid a multi-million dollar investment in brick and mortar (i.e. for the proposed building expansion). PES developed alternative kit cell layout concepts (for both small lot and bulk commodities) based on industry best practices which promoted efficiency, good ergonomics and supported the Master Material Flow Plan. We established cost-effective methods for moving kits to/through the kitting area, appropriate kit pull signals and efficient delivery routes. We also performed the layout analyses for relocating team rooms and maintenance cribs in order to free up premium floor space for kitting. Finally, we prepared detailed 2-D and 3-D layouts of the preferred alternative for installation. Our long hours of up-front planning helped to re-engineer this factory into a highly agile and flexible operation capable of building multiple models according to consumer demand. 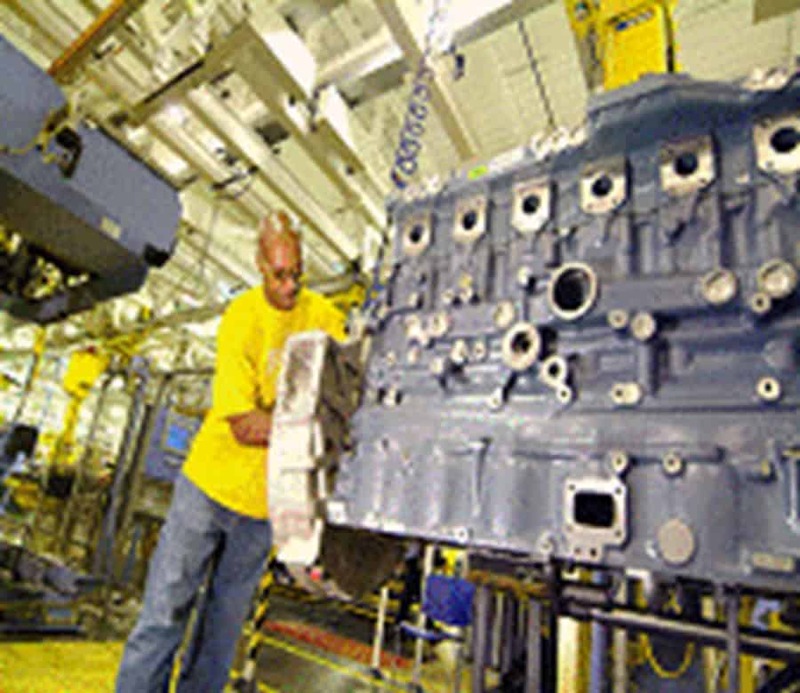 A leading heavy-duty diesel engine manufacturer was beginning a significant endeavor to expand operations by introducing two new engine models with hundreds of option variants into their existing production (i.e., product complexity doubled). This required the design and installation of a new Final Process and Paint Line to facilitate quality, improve product flow and reduce costs. PES participated in the detail planning and developed direct labor standards/requirements, balanced production line, determined appropriate station equipment requirements (e.g., that promote Poke-Yoke) and developed ergonomically-sound workplace layouts for the proposed new line, resulting in a 26 percent improvement in productivity over the existing line. We also prepared the work station equipment bid documents/specifications for the turnkey supplier (i.e. material display equipment, assembly tools, benches, carts and racks, etc.) that accurately depicted and documented project requirements, providing a basis for soliciting truly competitive proposals. Once the project was awarded, PES worked with the owner and turnkey supplier to develop a ramp-up plan for establishing the proper staffing of the newly-installed line during the first nine months of production. 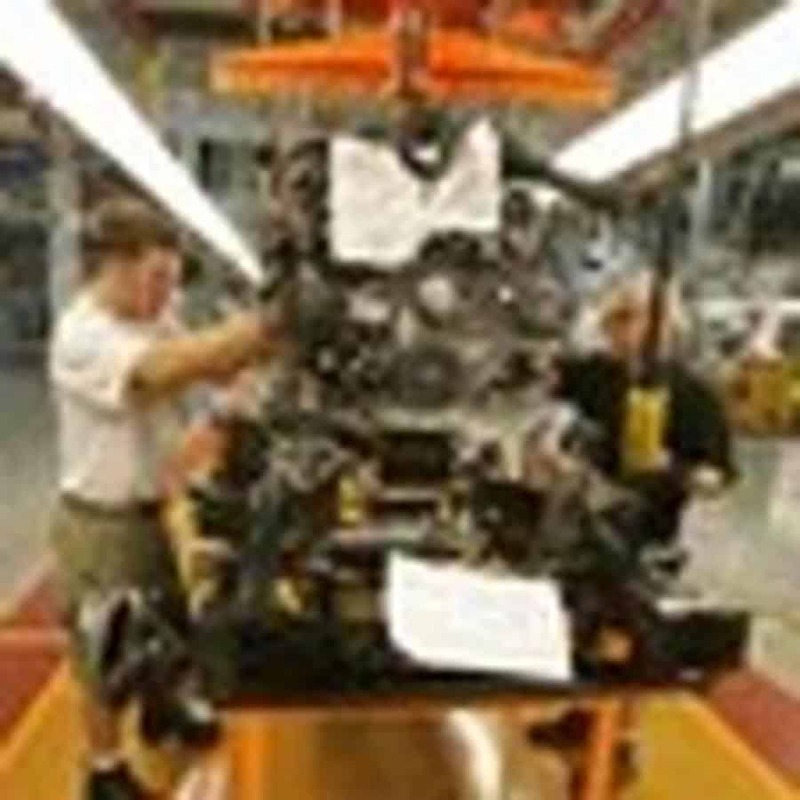 A Big Three automaker needed to replace an aging pre-World War II era plant with a 2.1 million sq. 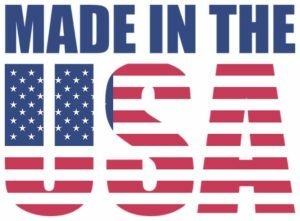 ft. state-of-the-art assembly plant that would efficiently produce its new line of SUVs while achieving a high level of quality. We applied worldwide best practices to help design lean material flow solutions for all inbound production parts planned for the Greenfield assembly plant. We created and maintained a “plan for every part” (PFEP) database, which served as a cornerstone for the detail planning of the material delivery and supermarket CMA’s. Our team developed effective processes and plans to efficiently receive, store, deliver and control incoming material to BIW and T/C/F Shops and support the client’s guiding principles, which included a worker-friendly flow of parts, level pull systems, and JIT/sequenced delivery. Our services included synchronous material flow design, inventory space planning and storage analysis, dock analysis and layouts, indirect labor planning, and feasibility studies to assess alternative material handling and storage methods and layout plans. We integrated the material flow, packaging and logistics studies to optimize the supply chain. This $1.2 billion assembly plant was featured on the cover of Modern Materials Handling Magazine for its “lean material flow” design. An automotive OEM was rearranging its 900,000-square-foot warehouse into central material areas to accommodate a growing business and become more competitive. Management had reorganized the hourly workforce into teams and was planning to make the team members responsible for workplace organization and housekeeping activities in their assigned area. The employees were convinced hiring additional employees was warranted to support the increased workloads. However, management insisted that PES complete an Industrial Engineering study to objectively determine labor requirements and identify productivity improvement opportunities prior to committing additional resources. First we spent several weeks collecting data and information pertaining to current and future operations including a one-year history of receipts and disbursements derived from the electronic material system, job descriptions, standard operating procedures, work schedules, maintenance procedures, housekeeping requirements, UAW work requirements/constraints and AutoCAD plant layout. We performed extensive in-plant field checks and observed operations to document material handling and storage methods from dock to dock. We interviewed a representative cross section of employees to determine what work is done, who does it, how much time it takes and how each job is done. Next, we performed a Travel Analysis to quantify the number of trips and distances traveled throughout the warehouse. Finally, we completed a workload analysis to quantify workloads and estimate labor requirements based on engineered work standards, wristwatch timing, judgment estimating and other information compiled from the above steps. The study showed that by rebalancing work, the existing workforce could accomplish normal daily activities and take on the added housekeeping and workplace organization responsibilities. Furthermore, we identified a number of process improvement initiatives that would streamline operations, improve customer service and reduce labor requirements. This study also resulted in a library of standard data that could simplify the development of future labor standards at this warehouse. 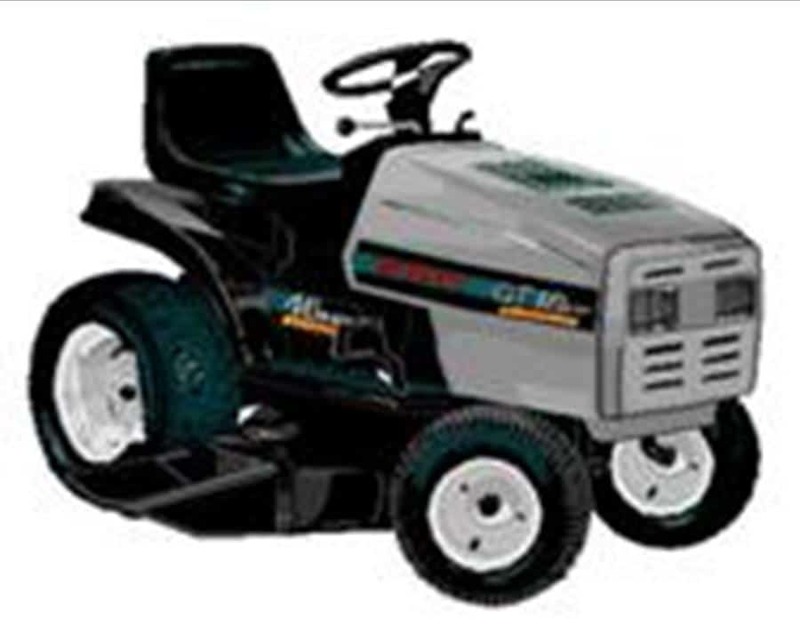 A lawn and garden tractor manufacturer was facing intense competition and declining profits and wanted to reengineer its operations from a traditional batch and queue into a lean and Flexible Manufacturing System (FMS). The FMS would allow them to produce a variety of quality products to specific orders and delivered with short lead times at a competitive price. A major challenge facing the re-engineering team was to improve labor productivity while maintaining good employee relationships and obtaining their participation and buy-in. First, PES trained and certified select team members in the MOST work measurement system, the principles of motion economy, work simplification and mixed model line balancing techniques. Then we developed standard data, identified best methods, and rebalanced the assembly lines. Next, we coached those teams in implementing the process needed to make it happen. We developed work management manuals documenting everything necessary to support the line balances. Using a team approach not only promoted ownership and built commitment to the program, it left these employees empowered to continue to improve productivity after PES left. By reducing wasteful and non-value adding activities, productivity increased by over 20 percent in the final assembly department. 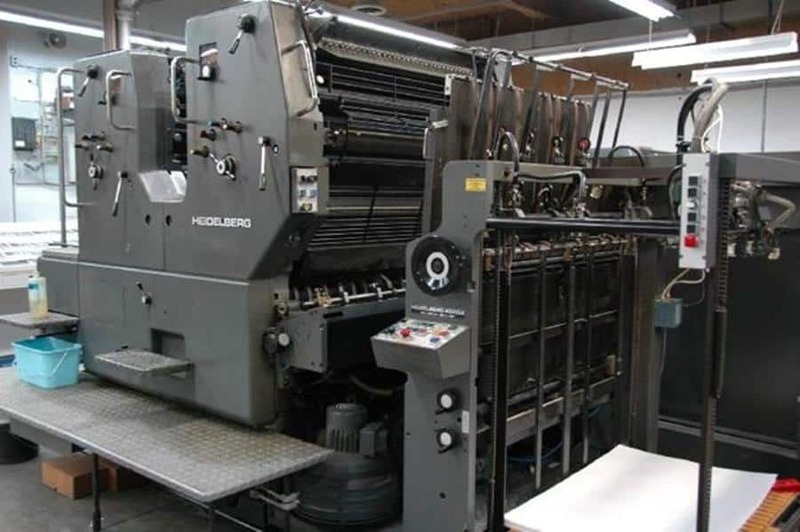 A manufacturer of printing products including continuous and individual set business and data processing forms, was designing a modern 150,000 sq. ft. facility. Its plant engineers developed a preliminary layout of the new facility primarily based on qualitative factors that were highly influenced by preconceptions and false constraints. Management had no way of knowing how good the design was and could not afford to gamble with guesses. 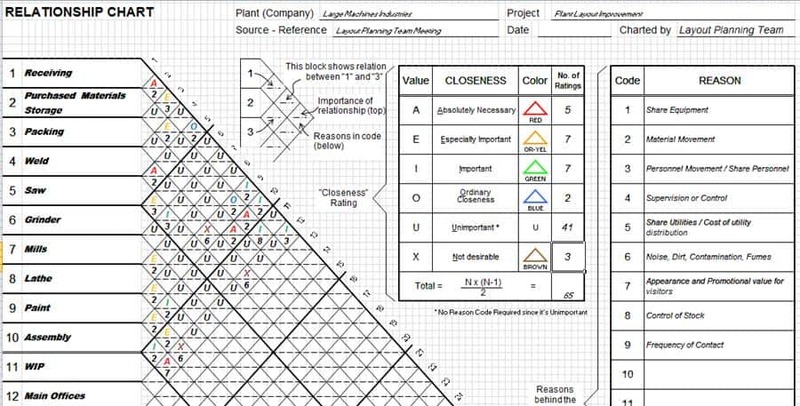 They needed a “fresh pair of eyes” to objectively critique and improve the new plant layout and communicate the many design tradeoffs with project members. 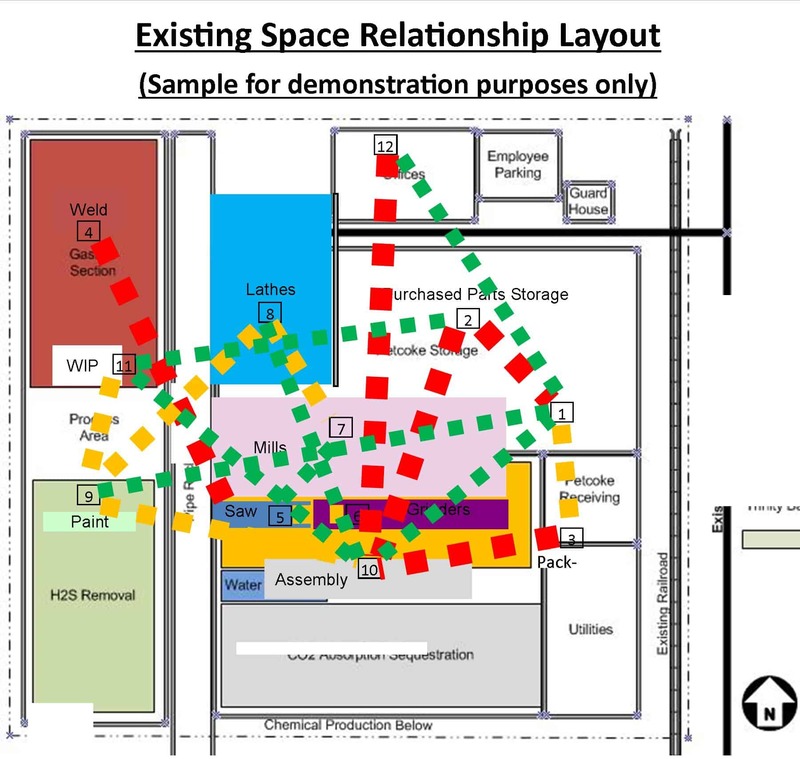 PES was commissioned to perform an independent quantitative analysis of the new manufacturing layout plan by analyzing product flows and production equipment relationships using existing routing and production data. 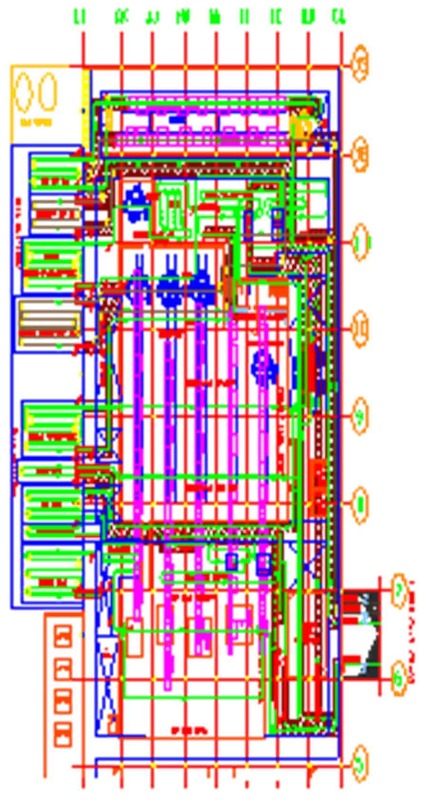 We utilized state-of-the-art industrial engineering tools and techniques including Computer Aided Product Flow Analysis (CAPFA) integrated with Computer Aided Design and Drafting (CADD). We collected material handling and product routing data, then developed data translation programs to convert existing production volume/routing data files into a useable format. Next, we generated detailed product flow diagrams overlaid on the proposed CAD layout as well as from-to charts, distance-intensity charts and material handling utilization reports to evaluate alternative layouts and select the best one. This analysis allowed the planning team to design the most cost-effective manufacturing layout that significantly improved product flow and reduced material handling costs while supporting the manufacturer’s batch flow operating philosophy. A leading global auto parts company needed to design and build a new 200,000+-square-foot chassis module assembly facility in North Americas’ first supplier park. This innovative, state-of-the-art supplier park project employed the Just in Sequence (JIS) delivery system for fast module supply to the OEM assembly plant. PES teamed with the prime architectural engineering firm to conduct a material flow sequencing and kitting study of 20 commodities in order to free up space in the assembly operation envelope, improve presentation of high proliferation parts and facilitate one-piece flow. We analyzed sequencing/kitting requirements, developed efficient sequencing/kitting processes, designed alternative layouts, determined ergonomic equipment requirements and prepared budgetary cost estimates to support this plants new synchronous/lean initiatives. PES analyzed storage requirements and developed storage layouts and equipment requirements for the new small lot material supermarket/CMA and bulk material storage CMA that facilitated FIFO inventory management and pull route delivery for chassis assembly. We developed cost-effective plans to resolve storage space shortages. We conducted the small lot route analysis to determine the most efficient material delivery route and number of tugger drivers/routes required to support full production volumes. Note that all material delivery is via tugger trailer trains and fork trucks. We conducted the dock analysis to quantify the number, by location, of receiving docks required and utilizations. PES also performed a transportation analysis to determine the number of over-the-road trailers per day needed for shuttling empty containers to the off-site warehouse. We determined floor space requirements required for off-site warehouse used to break down, sort and build-up empty returnable containers by type and supplier. This $37.6 million co-location project helps provide the OEM assembly plant the flexibility to build multiple vehicles on the same production line and react quickly to changing market demands. 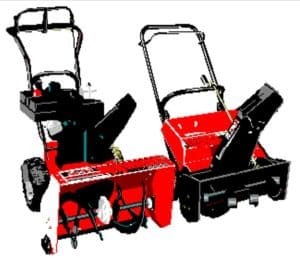 A major snow thrower maker was committed to improving productivity and balancing workloads in the final assembly department. Work standards were non-existent and staffing inequities were widespread (too many people at one work station and not enough at another). PES worked with the client to rebalance assembly lines and implement changes needed to make the plan work. We developed work management manuals documenting everything necessary to support the line balances including work standards, standard data, allowance structure, cycle time derivation, operator instructions, line layouts, assembly drawings, standard work practices, procedures and methods. This project resulted in $450,000+ per year in direct labor savings. Management now has accurate information necessary to develop realistic budgets and product cost estimates/quotes. 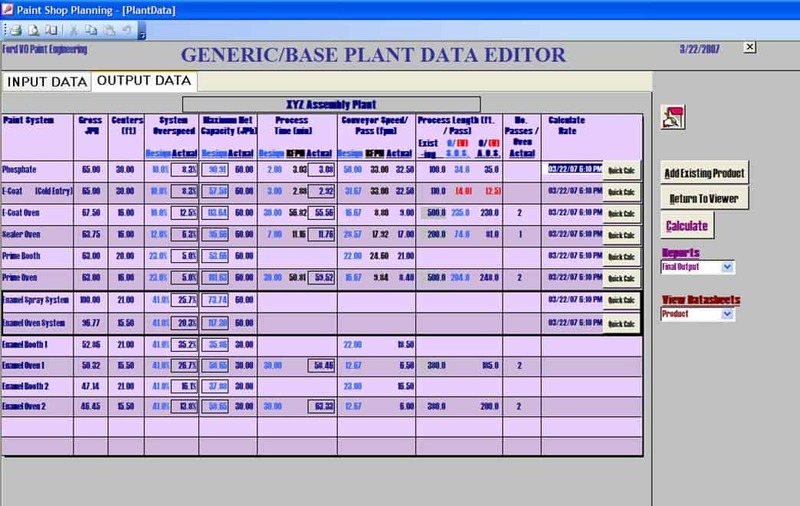 A Corporate Paint Manufacturing Engineering Group at a Big Three Automaker needed to improve communication, save time and boost productivity of its capacity planning process by converting its “every engineer to himself/herself” spreadsheet-based approach, which often produced conflicting or confusing results, to an integrated database solution that would provide one place to go for a unified view of the entire process. 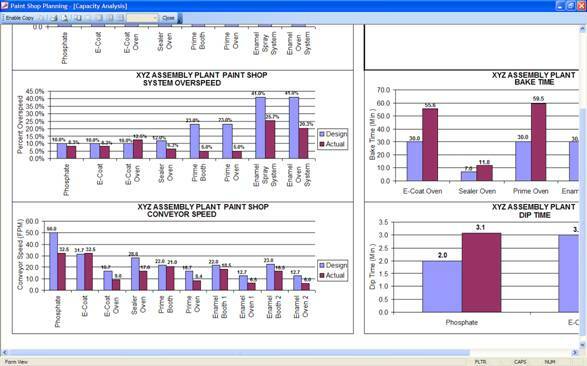 PES was retained to help design, develop and implement a custom database software application using Access and VBA that could assist this client with capacity planning and analysis of their worldwide Assembly Plant Paint Shops. The new multi-user database solution enables the entire team to use the same proven formulas, user interface, data, and output reports/charts resulting in the standardization of the capacity planning process. Because information is stored and retrieved in a single location and updates occur instantaneously, the data is the same and visible for everybody in real time. An easy-to-use Graphical User Interface (GUI) makes working with modules intuitive. Engineers can simply input or duplicate and modify existing hourly build rates, product mix data, and process and conveyor parameters for each plant or scenario. The program automatically generates detailed reports, charts and sensitivity graphs defining system and capacity requirements for Phosphate and E-Coat Tanks and Ovens, Prime Paint Booth and Oven, Sealer Automation and Ovens, and Enamel Paint Booths and Ovens. This new decision support tool enables engineers to quickly and easily perform “what if” analysis of existing plants as well as Greenfield facilities. Because this application is designed for multi-user operation on a networked environment the program facilitates the sharing of consistent capacity planning information for all users. It also provides a convenient way to assign security permissions to ensure that employees are able to update and/or query the database at the right levels for their jobs. 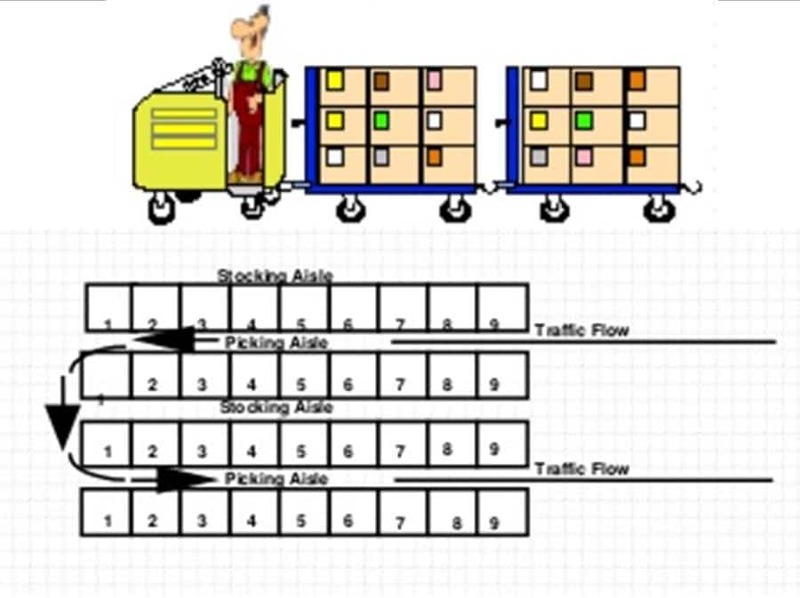 Not only does this solution help commonize the capacity planning process, but it also boosts communication and saves time and money. As part of a lean manufacturing strategy, this major producer of bicycles was designing a new focused factory for 24 inch and 26 inch bikes. 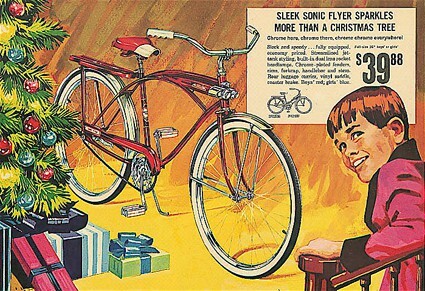 The paint shop design had to be flexible enough to accommodate bicycles requiring a wide variety of paint schemes using both powder and wet paint processes. 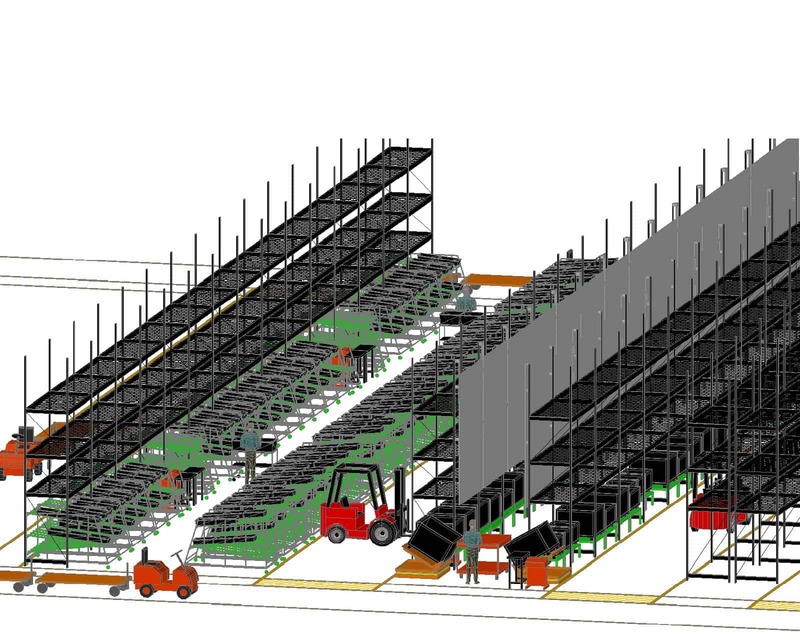 An automated overhead power and free conveyor system was identified as the most appropriate conveyance method. The new $15,000,000 flex paint shop design included 14 booths, over two miles of conveyor with an empty carrier re-circulator and selectivity banks, and 150 decision points with automatic tracking and routing of more than 3500 carriers. The system was designed to attain a maximum throughput of 650 carriers/hour and net 6500 bicycles per day. 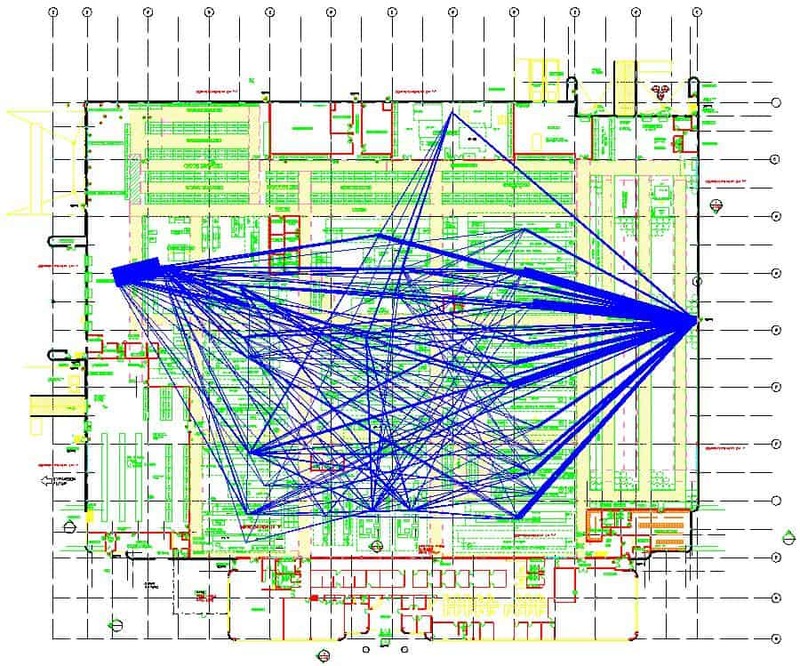 Due to the sheer size, complexity and unpredictability of this large-scale paint system, manual/static analysis was not practical. Computer simulation modeling and analysis was selected as the most appropriate tool available for testing and evaluating the dynamic behavior of the paint conveyor system design prior to making substantial financial commitments. The goal was to build an accurate, data-driven model of the proposed conveyor design that reflects real world production capabilities and would answer three fundamental questions: 1)Will the new conveyor system design work? 2) How well will it work? 3) What will it take to make it work more efficiently and effectively? The model was constructed using the WITNESS animated graphic simulation software. Since the client’s industrial engineers had practically no simulation experience, PES had an important secondary goal of training their engineers in the use of the simulation software, project methodology as well as in the specifics of their model to perform further what-if experiments. Using our proven interactive approach, PES worked directly with the client to collect data, prepare a detailed functional specification, convert existing AutoCAD layout file to WITNESS, construct and validate the model, conduct systems analysis, review progress, document and present results. The completed model was used to identify several major bottlenecks in product flow and test and evaluate conveyor design revisions to ensure that blockages were alleviated and target throughput was achievable. The model also highlighted potential gridlock conditions and allowed the team to fine tune control strategies, predict carrier requirements and size the empty carrier selectivity banks. Our analysis illustrated the potential for 25 percent + improvement in throughput capability of the base design. The result was a highly flexible and efficient conveyor system design, pre-tested for a fraction of the total capital costs. Furthermore, our clients industrial engineers with limited prior simulation exposure have been thoroughly trained by PES and are now able to use the model independently to perform ongoing analysis. Productivity Engineering Services LLC is a Detroit, Michigan industrial engineering consulting firm and operations management advisory services company. We provide industrial and systems engineering, lean manufacturing engineering, and supply chain management professional services. Copyright © 2019 Productivity Engineering Services LLC.